I was fascinated to see this FoodNavigator account of the recent United Nations’ call for action on nutrition. The lengthy new UN resolution on “a healthier world through better nutrition” begins with pages of preliminary comments before getting to bland admonitions that member states should improve nutrition, health conditions, and living standards; address hunger and malnutrition; and promote food security, food safety, and sustainable, resilient, and diverse food systems. The resolution encourages member states to strengthen nutrition policies that promote breastfeeding and control the marketing of breast-milk substitutes. Calls upon Member States to develop actions to promote physical activity in the entire population and for all ages, through the provision of safe public environments and recreational spaces, the promotion of sports, physical education programmes in schools and urban planning which encourages active transport. develop health- and nutrition-promoting environments, including through nutrition education in schools and other education institutions, as appropriate. Nutrition education? That’s it on improving the nutrition environment? 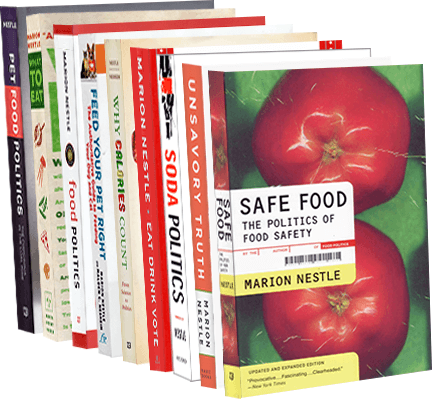 Nothing about curbs on food industry marketing practices, front-of-package food labels, soda or sugar taxes, or other policies established to be effective in improving nutritional health (see, for example, the policies listed on the World Health Organization’s database, or the NOURISHING database of The World Cancer Research Fund). The UN’s own Food and Agriculture Organization issued a report on the value of education in improving the food environment. Its author, Corinna Hawkes, makes it clear that education is useful, but is far more effective when it thoroughly involves policies to change the food environment. nutrition education actions are more likely to yield positive results…when actions are implemented as part of large, multi-component interventions, rather than information provision or direct education alone. It is notable that governments have been taking an increasing number of actions involving multiple components, such as combining policies on nutrition labels with education campaigns, public awareness campaigns with food product reformulation, and school food standards with educational initiatives in schools. To be clear: UN resolutions are non-binding. The UN cannot tell member countries what to do. All it can do is exert leadership and moral force. When it comes to the food environment these days, we need all the moral force we can get. We didn’t get it here. Vanessa Domine. Healthy Teens, Healthy Schools: How Media Literacy Can Renew Education in the United States. Rowman & Littlefield, 2015. If you are not concerned about the effects of exposure to electronic media on the health of teenagers, you should be. This book presents a well-researched, highly compelling case for the urgent need for media literacy education to be incorporated into school wellness programs as soon as possible. For information about how online marketing affects kids’ food choices, take a look at the work of the Berkeley Media Studies Group, particularly in media advocacy training. Center for Science in the Public Interest (CSPI) also has resources about online marketing to kids (scroll down for a list). No nutrition in medical education? An old story that might be changing. JAMA Internal Medicine invited me to comment on an article about the lack of nutrition education in medical schools. This was written by Nathanial Morris, a second-year medical student at Harvard, who complains about the paucity of nutrition instruction in his curriculum. Yet the course spanned just 3 afternoons, for a total of 9 hours of instruction…The course directors told us it would be the only time for dedicated nutrition education during our 4 years as medical students. There were no examinations nor interactions with patients. The 1 lecture on obesity lasted 45 minutes…As a medical student, I cannot fathom why medical schools continue to neglect nutrition education. When I read his article, I didn’t know whether to laugh or cry. I wrote almost identical articles in the 1980s based on my experience at UCSF (here’s one). I asked a former UCSF colleague, Dr. Robert Baron, to co-author the commentary with me: Nutrition in Medical Education: From Counting Hours to Measuring Competence. Our interest in this issue started nearly 40 years ago, when we were both at the University of California, San Francisco (UCSF), School of Medicine. In 1976, one of us (R.B.B.) was, like Mr Morris, a medical student advocating for nutrition instruction, while the other (M.N.) was a lecturer newly recruited to provide that instruction. For the next decade, we worked together to create “NutritionUCSF,” a comprehensive program of nutrition training that at its peak encompassed 16 hours of preclinical instruction; regular lectures and ward rounds in several clinical rotations; an intensive, 1-month fourth-year clinical elective; an ongoing lecture series for the health professions community; and postgraduate continuing education courses. In addition to our youthful interest and enthusiasm, we were able to achieve all this for a simple reason: we had funding. Funding came first from a curriculum development grant from the Health Resources Administration and later from a private foundation. These grants allowed us to pay faculty for a small portion of their time and leverage nutrition hours into the curriculum. Today’s medical education reform movement must respond to this call by including a broad competency-based approach to improving the nutrition-related skills of physicians. When it does, we may finally have the opportunity to include advice about healthful eating as a routine part of 21st century medical practice. It is interesting in this context that various members of Congress are introducing bills to improve nutrition education for medical professionals, for example, the EAT for Health Act and the ENRICH Act. Thanks to Jamie Berger for alerting me to this legislation and for sending some fact sheets about the bills: EAT for Health / ENRICH. It’s been nearly 40 years since my involvement in this issue. Ever optimistic, I’m happy to see some progress at last. The current issue of the American Journal of Clinical Nutrition has papers from a symposium on nutrition in medical education. The first was in 1962, so the half-century saga continues. Policy approach to nutrition and physical activity education in health care professional training. Matthew D Levy, Lisel Loy, and Laura Y Zatz. Am J Clin Nutr 2014;99 1194S-1201S. 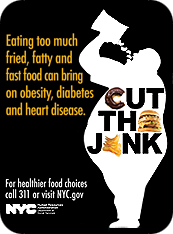 New York City’s Human Resources Administration (HRA), the agency that administers the Supplemental Nutrition Assistance Program (SNAP) and other food assistance and food emergency programs, just launched the second year of its “Cut the Junk” initiative. good nutrition can both save lives and taxpayer dollars…Cut the Junk presents a common-sense approach to eating healthier with less expensive alternatives than take out and fast food. Each tip in the booklet can help stretch a family’s food budget or food stamp benefits further. We are very proud to come directly to people’s neighborhoods to start talking about healthy food as an affordable reality for New Yorkers. HRA did the campaign with Cornell Cooperative Extension. I think the video works well. The booklet? Not so much. I wish both said more about sodas. “Grab an apple instead of a soda” doesn’t quite do it. The video connects viewers with city food assistance resources, and that’s a plus. Will this campaign encourage low-income residents to choose healthier diets? I hope an evaluation is in progress. What to say about the booklet? Take a look and tell me what you think, please. For my thoughts on the recent Associated Press report (unpublished except in newspapers) suggesting that nutrition education doesn’t work to change people’s eating habits, see my interview at Eating Liberally.